Rain gardens beautify our world. Find all you need for YOUR native rain garden. Rain gardens beautify yards, protect the environment and create habitats for other native species! Rain Gardens overflow with native plants, in a world of gardens filled with posies and marigolds. Why natives? Because they evolved to fit their environment. They are naturally drought, flood and pest resistant. That translates to less work for the novice gardener and the pro, once all the initial work is done. 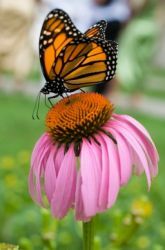 Native flowers, sedges, grasses, bushes and trees that make up the rain garden attract the butterflies, frogs, turtles, toads, and birds, that depend on them for their food and homes. This creates a backyard habitat for you and your family to watch, enjoy and learn from year after year. Help the Environment at the Same Time!! Simply planting a modest rain garden somewhere around your home helps lock rain water in the ground, reducing the flow of pollutants and poisons into the drains. Using organic fertilizers and pesticides in your garden further protects and brings health to your yard and all the species living there, you included. Here is one final benefit. A rain garden brings to you and your family the beauty of nature in all its wonderful array. It is organic and completely unfooled with. No genetic tinkering here!! These flowers and plants come straight from the woods, plains and streams. Why not add a little bit back to the world and bring these beautiful rain garden additions to your yard? Tips for a happy Rain Garden. Get tips and adivise about rain gardens from those who have been there and done. Learn from their successes and their failures. What is a rain garden? How is it different from other gardens? The rain garden is quickly becoming the "en vogue" thing in the suburbs and among small businesses. Resources say native wildflowers are best for your rain garden. If you're having a hard time finding the right natives try this page. Watch my rain garden grow. Wildflower seed might be a good choice for those who have a large area to cover. Would you rather grow your rain garden from wildflower seed. Try native wildflower seed. Organic gardening is the best way to get control of weeds and pests. Organic gardening helps you control pests and weeds without poisoning your family and wildlife. A little garden decor could add just that one more touch of beauty to your already delightful rain garden. Capture excess roof run-off in a rain barrel. A rain barrel is another way of capturing rain water for later use. Mosquitos are a threat to our health. Mosquitos love water. What can you do to protect yourself? There is a small selection of rain garden bulbs. There are rain garden bulbs for those of you who prefer planting bulbs as opposed to standard plants. Why not try growing mushrooms? Here is a comprehensive list and brief discription of all the wildflowers recommended for your rain gardens from several recommended lists. Wildflowers are beautiful, but ferns and grasses add even more beauty to your garden, while providing wildlife with nesting materials and hiding places. Consider long lasting trees and shrubs for you native rain garden. Garden tips to help you grow your rain garden. Links to great garden tips. Find southeast trees and shrubs to complement your rain gardens. Native Rain Garden recommends these site for you. Native Rain Garden's recommended books and other resources. Native Rain Garden recommends these books and other resources for use in your garden building. Conservation is the key to protecting our prescious Earth for the Future. Would you like to share your knowledge about native rain gardens? Great, find out how you can submit your story or tip here.